The joys of blogging at 6:00 AM. So it’s 6:00 in the morning, and my body apparently hates me, because I’m wide awake. I can’t remember the last time excitement woke me up. But in four hours, my best friend in the whole world will be here, and we’ve been apart for the longest time we’ve ever been apart, and I can’t sleep. Geez, Beth. She hasn’t even left her house in Saskatoon yet. You’re such a geek. So I thought instead of doing something productive, like packing up everything in my room, I would write a blog. What’s worse than being up at 6:00 is having gone to bed at 1:00. That’s because I was at a rager of a party last night. Well, as raging as a party full of seminary students can be. I admit, there was some Scripture read and some worship songs sung. We have to be a little stereotypical. But there was also plenty of mud wrestling, so, go figure. It was Tora’s birthday party, and she chose to be born right after everyone’s exams were over, which is highly beneficial, because everyone wants to celebrate, whether they know Tora or not. I think there were 60 people there, at the beach, and way too much food for all of us to eat. 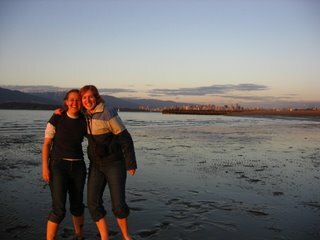 The best part of the night was that the tide was really low – we went running on the mud flats as the earth tilted past the sun. Johannah did cartwheels and Bob slid along his stomach and Amanda did interpretive mud dancing. And I realized… as much as I want to see my grandma and my family and friends and work at camp, I’m really going to miss this place and these people over the summer. As I was trying in vain to force myself back to sleep, I came up with a plan for the day with Christine. We’ll see if she goes along with it. She will arrive at 10:15 and I will be waiting at the right door to meet her this time. Then we will come back here and have lunch, and then we’ll go watch “Take the Lead” with fabulous Antonio Banderas. Then we’ll do something for the rest of the afternoon. 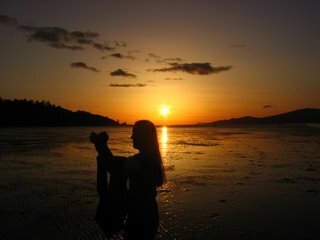 Then we’ll eat supper and by then the tide will be low, and we’ll go down to the Rock and find purple starfish. We will walk down to Jericho Park and I’ll introduce her to all my favorite ducks, and then we’ll find the mud flats and go running in them, like last night. But this time I’ll be better prepared, with a towel. We will then take the bus to the Regent party of the night, at Matt’s house, so I can say goodbye to all my friends. We’ll walk part of the way home, in the dark, because for some reason my best friend likes to walk in the dark, when you can’t see any of the beautiful scenery. She thinks it’s mysterious or something. I just think it’s freaky. I think that’s part of the fun for her. So that’s the plan, Stan. The only glitch might be that I’ll most likely be ready for bed by supper. 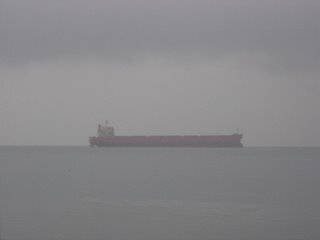 Or maybe it will start raining and ruin my plans, like it was when I took this cool picture of a freighter. www.eisley.com. They’re from Texas, four home-schooled siblings and their next-door neighbor, and I think the oldest one is a year older than me. The two vocalists are sisters, and their voices are incredible together. It made me want to sing with my family. Anyway, we were the oldest people at the concert, I think. And I realized something…here it is: I am not cool. In fact, I am un-cool. This perhaps doesn’t come as a surprise to you, but it really hit home the night of the concert. Everyone was dressed cooler than me, with suspenders and shirts over dresses and band t-shirts. Everyone was doing this dance move with their hands that made it seem like they were trying to brush dandruff out of their hair. Actually, it’s called “raise the roof”. I am not cool enough to know. One of the guitar players in an opening band was wearing a poncho. Just a poncho. Ponchos are cool. I didn’t know that. I thought they were itchy. Also, the bands kept telling us to check them out on myspace. I only found out what myspace was about a month ago, and that’s because I have a roommate who’s cool. I am officially behind the times. At least cool people still hang out with me. Like Danice. She can dance and she knows all about the 80s, and those things are cool. I don’t know anything about the 80s except that I was born in them. But I’m learning. She is schooling me in 80s music and movies – after the concert we watched “The Breakfast Club”. It was cool. I felt a little bit cooler. I bet now that I’ve used “cool” 50 times in one blog, I’ll find out that the word “cool” is no longer cool and has been replaced, thereby making me all the more uncool. Or whatever the word is now. I’ll write again probably, with Christine. And if we don’t find the time… I’ll see you Saskatonians on Tuesday!